﻿Aristocrat Auto Hire is a Wellington based Wedding Car Hire company, who supply chauffeur driven Classic Daimler and Jaguar wedding transportation, at a competitive cost. The face of this business is Duncan, who has devoted countless hours into maintaining the vehicles to the highest standards possible, whilst keeping them in their original form. These vehicles are truly a testament to the love, time and dedication put into them, as they run beautifully and are in absolutely peak physical condition. Photographers love using our vehicles in their shots, as the high gloss paint reflects beautifully, allowing artistic and beautiful photographs to be captured. We encourage you to browse our gallery to view such artistic shots. We offer one of the most unique, matching fleet of bridal cars available in Wellington, with five identical navy blue classic cars available at your request. 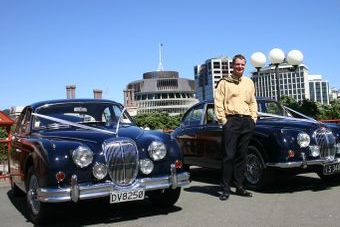 No other chauffeur in Wellington can offer you this many identical classic cars at such affordable prices. Aristocrat Auto Hire is a small, friendly family business that has been operating for twenty five years. The cars we own are not only a business, but are a passion, which allows us to keep our prices low, while ensuring you get the best possible service. We are located in Wellington, and are happy to have people come view the cars. If you wish to do this, please contact us. We hand pick our drivers, not only for their good driving ability but also their professionalism, helpful manner and their willingness to 'go the extra mile' for our clients, something which we value very highly at Aristocrat Auto Hire. Our Wedding Car Hire Service is designed to take the worry out of this important part of your Wedding Day arrangements. We provide a service of courtesy, distinction and promptness with uniformed, professional and helpful chauffeurs at very reasonable prices. All our vehicles are valeted and polished on the morning of your wedding, so you can rest assured the vehicles are immaculate. Photos of our fleet can be seen here.